When Manzanar was a new and blossoming town in Owens Valley. 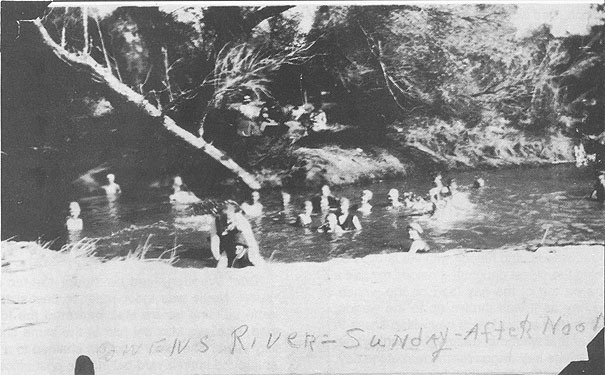 Manzanar residents swimming in Owens River. 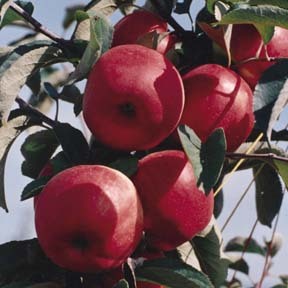 Apples which used to abound around Manzanar. Homes in the town of Manzanar circa 1920. Lena had more problems with her asthma, so they had to relocate again. Joe talked to a man, Art Williams, who told him about his home town of Manzanar. Joe decided to look for a farm there and later he and brother Charlie decided on Manzanar. 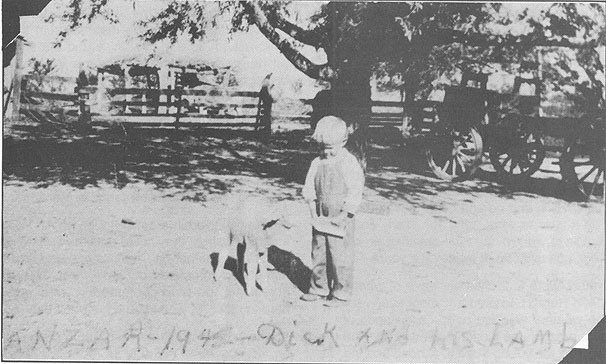 They tore down the house in the oil field and bought all of the things needed for a farm: horses, cows, machinery, tools of all kinds, and lumber, including the material from the old house. Charlie and his wife, Veronica, did the same, and they all headed north to the Owens Valley, first on the broad gauge railroad arriving at Owenyo Station with all their possessions. These were transferred from the broad gauge to the narrow gauge cars, then on to Manzanar Station where everything was transferred to wagons which they assembled at the station. Horses were hitched to the wagons and the cows were tied-to the rear as Joe, Lena, Charlie, Veronica, and the children took off for their new farms in Manzanar. Manzanar, known as the Land of the Big Red Apples, was five miles south of Independence, county seat of Inyo County, and ten miles north of Lone Pine. The main automobile road through the Owens Valley was unpaved at this time; much later it was paved from Mojave to Nevada and made an official State Highway (US 395), one of the arteries of the State of California. 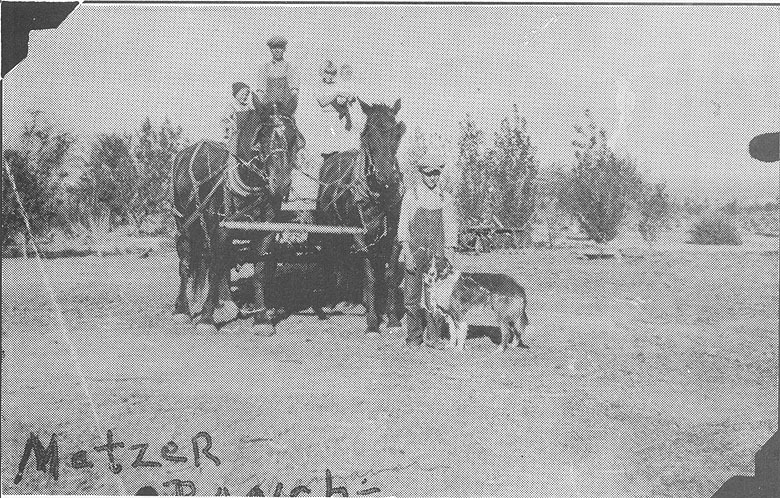 In the early 1900s the City of Los Angeles started to purchase ranches in the Owens Valley for the sole purpose of supplying water to the people in Los Angeles. People started to sell their land to the City; the City put in wells to drain the water out of the ground; the trees began to die; and the land finally turned to vacant dirt. This ended the Land of the Big Red Apples. Owens Valley was once a fine place to hunt and fish. Wild geese and ducks stopped on their way south for the winter at the many ponds and water places. Quail, doves, pheasants, and rabbits, and deer who came down from the mountains during bad weather were plentiful. Sometimes, late at night in the winter, from our home we could hear deer thundering down a nearby road to get away from the deep snow in the Sierras and across the valley to the milder Inyo Mountains on the east side where it was warmer and drier.